Meeting Sandeep K. Maniaar is almost meeting a bunch of energetic forces that grab you from all corners. I get to feel an energetic, positive aura circling around him all the time. His face, eyes, body language and his words have the same energy level. By profession he is an EFT practitioner. EFT means Emotional Freedom Techniques®, which deals with all physical, mental and emotional problems. Where emotional relief brings physical health, Self help method often works where nothing else will, No Drugs Involved ~ High Success Rate. 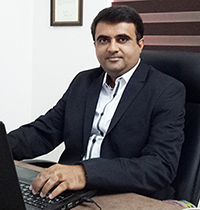 Mr. Maniaar is the only registered practitioner within the Gujarat, a state of India. He has helped hundreds of humans solve their problems. “The best thing about EFT is that it solves problems within minutes no matter how serious they are or how old they are”, says Mr. Maniaar. Apart from EFT, he masters skill in fields of Tarot, Hypnosis, Mind programming and training, Spiritualism, Meditation. Because he is different from common human-herd, here I’ve asked him some ‘hatke’ – out of the way questions. Speakbindas: Tell us few things about you that people don’t know. Sandeep Maniaar: The first secret about me is I’m not having any educational background in the field of Medical Science or Psychology. But my interest led me to this profession. I was a student of DEE (Dip. Ele. Engg.) of BPTI Bhavnagar, but I left my studies of engineering just before my final exam of final semester… because I lose my interest in the typical studies. Then I started my career as a “Ladies Tailor” (no envy please…) and started my boutique but after 4 years of the show I couldn’t fit myself in the 12’x10’ size shop. I was also attracted to Tarot Cards and with positive curiosity, I started learning the Tarot. Then I joined a job of direct sales (Door to door Marketing), after 6 months just left that job and started marketing of the accounting software, again changed and switched to other project along with my boutique. Then I joined a marketing job in “Print Media”… also started my advertising agency… but there was no progress… in the meantime I started professional Tarot Reading, but I was in search of something unique, I’ve taken the training in Hypnotherapy, NLP, Mind programming techniques etc. 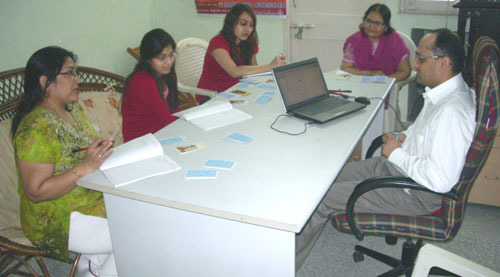 and started Hypnotherapy and Hypnosis training as a main profession. And in 2003 on a beautiful day I came across to the Emotional Freedom Techniques® on the internet… I used it and learned professionally… finally equipped with EFT as a profession. Speakbindas: Tell us something about EFT and its effects. Sandeep Maniaar: I can say, EFT is the unique Healing Modality as well as the “World’s fastest Mind Programming Techniques”. As a result, EFT is spreading quickly among the healing community. It is an emotional version of acupressure wherein certain meridian release points are gently stimulated by tapping on them with the fingertips. It is a simple, rapid and remarkably effective approach to healing emotional disorders that is based on a synthesis of Chinese acupressure and Applied Kinesiology. There are no drugs involved and high success rate with EFT. Sandeep Maniaar: In the late 1970s, psychologist Dr Roger Callahan combined elements of quantum theory, kinesiology and acupressure to begin healing patients with phobias and traumatic stress disorders. He used a system of different combinations of tapping points for different issues. This highly effective therapy was termed Thought Field Therapy (TFT). Gary Craig, a Stanford engineer who studied with Dr Callahan, extended the concept by devising a set of all-purpose tapping points, which was found to be easier to learn and remember. He called his system Emotional Freedom Techniques, or EFT. Since it’s inception, EFT has found favour with more and more practitioners of the healing professions–more and more licensed healers now use EFT as part of their repertoire. Speakbindas: What’s your take on current religions? Sandeep Maniaar: Nice question Devang… first of all… what I believe about all religions of the world is something like “at present, they are not presented in their original format, they are manipulated by the disciples and followers. Main aspect of a religion is Spirituality and humanity but the religion became more ritualistic then realistic now a days”. I was born in Jain family, but I don’t want to claim myself a “Jain”… but rather I would like to be known as “Spiritual”. Spirituality is the main aspect of all religions and their sects. I believe in the energy. Energy is formed with Positive and Negative both. Thought is energy and energy is power, and it is because all the religions, sciences and philosophies with which the world has heretofore been familiar have been based upon the manifestation of this energy instead of the energy itself, that the world has been limited to effects, while causes have been ignored or misunderstood. Our Yogic way also defines the religion is “Self awareness” or “Consciousness” as real wisdom of the Humankind. So the real religion is “understanding the self”. What do you think? I agree with your explanation. Religion is not what it is presented today. Speakbindas: How to increase our self-confidence? Sandeep Maniaar: There is no prescribed formula to increase our self-confidence. Rather I would say, Just look within and see yourself as a person with “Self-confidence”… everything is within. Simply you need to accept it. Speakbindas: Your take on money. Sandeep Maniaar: Money… I like this question most because I’m “Money-Yaar”. Speakbindas: Why do you think people are so unhappy these days and looking for peace, even rich ones (for that matter if richness is meter of happiness)? Sandeep Maniaar: The real reason is People are lacking of “Self Awareness”… that’s all. Speakbindas: Coming down to at ease now. What are your hobbies? 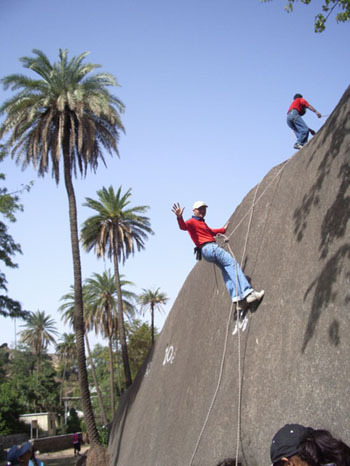 Sandeep Maniaar: My main hobby is having so many hobbies. Speakbindas: Your message to youth. I want to learn hypnosis. I want to became a best hypnosis master. i could not give you very high fees. normal fees i can give you. If you want to make me a master in your vacancy plz. reply me. I want to strongly to learn hypnosis. I want to wish hypnotisam.Send some information.i.e.adress of training centtre,how much time required for complete training,what will be cost. etc. My main hobby is having so many hobbies. I like it. We as people not realized the role hobbies can play in our lives – even more effective than ‘ Navadha Bhakti’ !! 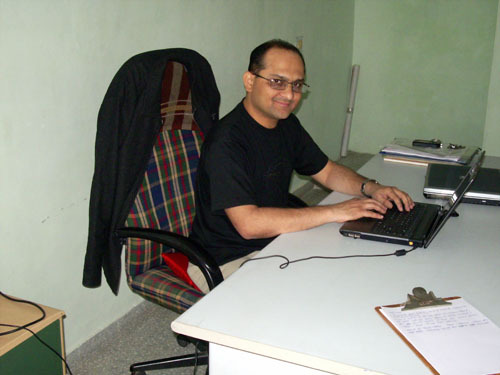 .-= Suresh Jani´s last blog ..સમ્મોહન હીપ્નોટીઝમ) : ભાગ -1 =-. i am glad to khow about this treatment. i was serching same like this. please , its my humbel request to you that give me contact number of doctor with addres. By this you will save one life. I will like to meet Dr. Maniyaar.